The 6 to 8 week science study gives an introductory overview of the animal kingdom. This study is a unique Waldorf approach where one begins to gain a sense that each animal specializes or exaggerates some quality within human physiology. The birds tend to specialize in the nerve/sense system; while the hoofed animals tend to have an enhanced metabolism. In short, one begins to perceive metaphorically that the human being is the whole of the animal kingdom writ small and the animal kingdom is the human being written large. This book contains the daily activities for the student as well as the background study for the teacher in learning this topic. The artistic intent with these lessons is to convey a sense to the student that the animal is formed to a great degree by the element it inhabits. The bird’s feathers are hollow –filled with air, and its bones too, tend toward this air-filled hollowness. 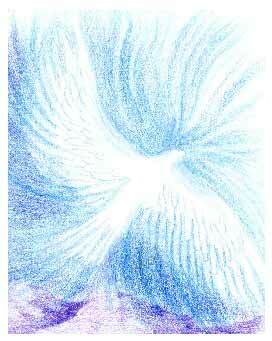 In the drawing below that was done with 10 and 11 year-old students, the swirling cirrus clouds shape the bird’s form. Thus the animal’s form is created from the outside. 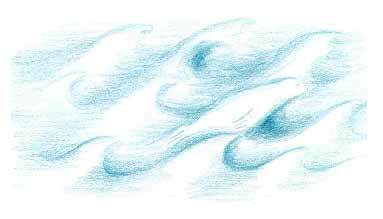 Do you see the seal that emerges from the waves or the fish that is formed out of the swirls of water? These type of pictures take a little practice but are a good way to give artistic expression to the portion of your animal studies where you will want to explore animals of the air and of the sea. From these broad contexts, one could lead into a week of lessons that investigates animal environments comparing, for example, the foliage of the jungle, its climate, water supply, the strata of canopies, etc. with the types of animals it shelters, as well as the interrelationships among the species. The teacher can still find ways to artistically integrate the animal’s form into its surrounding environment. For instance, the camel’s hump echoes the humped dunes behind it, or the bison’s torso finds a kinship to the rolling prairie hills. We offer these as suggestions to spark the home teacher’s imagination with lesson ideas. If you choose to study animal habitats, then a good way to approach this is to work with polarities such as animals of the ice regions compared with animals of the deserts, or animals that inhabit open areas compared to animals that live in enclosed areas, etc. In the book The Living Planet, David Attenborough suggests 12 basic environments as habitats for life on earth.